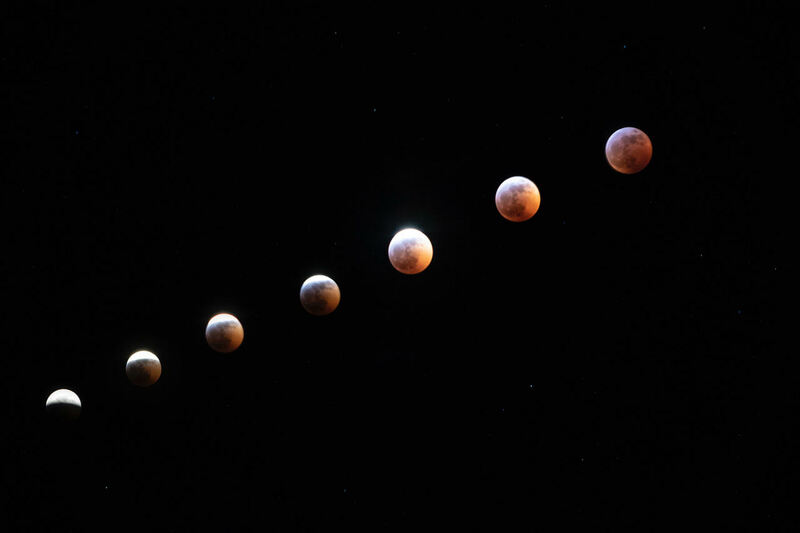 Rick Blanchard — a Cody resident, and one half of the locally known “Rick and Ron” of Wyoming River Trips — captured seven stages of the total lunar eclipse Saturday. It was known as the“Super blood wolf moon,” but let’s not get so distracted by the name that we lose sight of how spectacular these events are and what really happens during them. In addition to having one of the most ridiculous names for a lunar eclipse in recent history, the Jan. 19 event was also reported to be the first time a meteorite was recorded hitting the moon during a lunar eclipse. Spanish Astronomer Jose Maria Madiedo snapped a pic of it. He’d been trying to capture such a moment for more than 10 years. While Blanchard did not catch the meteorite striking the moon’s surface, he did manage to capture the rise of the moon, its movement toward syzygy and the Rayleigh scattering that provided the “blood” color. A lunar eclipse occurs when the sun, earth and moon are in syzygy — a roughly straight line — and only during a full or new moon according to WikiPedia. Rayleigh scattering — the refraction of sunlight by the Earth’s atmosphere — creates the red hue of the eclipse. It’s the same phenomenon that makes the sky look blue during the day and gives sunrises and sunsets their trademark colors. The National Geographic Science and Innovation blog credits the “wolf” in the popular name to traditional Native American and medieval European descriptions. According to Westernwildlife.org wolves mate between January and March making increased activity during this moon phase a plausible explanation for the name. Blanchard shot the photo from his back deck on a tripod-mounted Canon 7D Mark II camera with a 70-200mm f/2.8 lens. He captured the first phase at 8:30 p.m. and estimates he shot the last frame around 10 p.m., when the moon was in full eclipse. He then stitched seven images together in photoshop to create the composite.